This story is a series of coincidences. It started on a hot weekday last June, a perfect day for Korean cold noodles (naengmyun). I had made dinner plans to meet Rachel at Han Joo in East Village, so I made my way there after work. While waiting to cross the street at the corner of St. Mark’s Pl. and 3rd Ave., I heard a loud voice behind me talking about Nutella. He sounded very self-assured, as if lecturing on the wonders of hazelnut chocolate spread. Curious, I turned around and realized that the loudmouth behind me was my friend Drew. What are the chances? It gets better. Drew was with two friends, Brandon and Travis, who were visiting from Florida, and they were also on their way to dinner. So I invited them to eat with me and Rachel (she arrived a bit later). The five of us had such a good time over noodles and BBQ that afterward, we decided to head across the street for dessert at Spot. As anyone who has tried to visit Spot on any given evening — but especially on nice days — can tell you, the place is always crowded. We waited right inside the door for a table to open up. Incredibly, nobody else in the restaurant seemed to notice. Or maybe they were all keeping their cool a little better than I was. Tyra was with three other friends, none of whom were recognizable. That’s one thing I love about New York: People don’t care much about celebrity sightings, or they’re just too busy to notice. I always betray my humble suburban roots when I flip out…but I’m working on it. 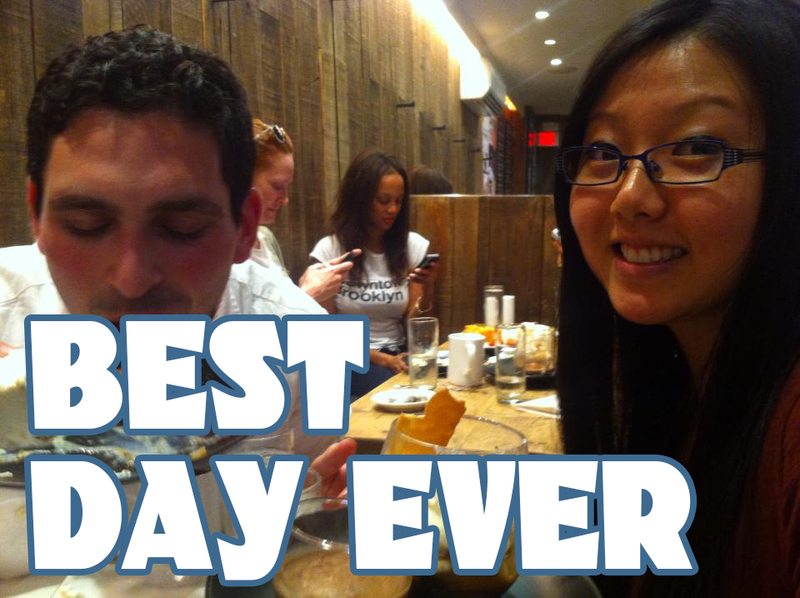 When the server finally came over to get us, he ended up seating us AT THE TABLE RIGHT NEXT TO TYRA’S. I officially had a meltdown. Of course, my companions were psyched too, but I suspect I was the only one on the verge of death/cardiac arrest. I have faithfully watched every season of ANTM since high school (admittedly, some of it was hate-watching: eg. Allison was robbed), so clearly this was a big deal to me. 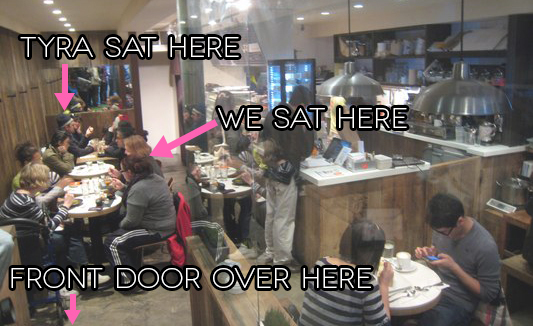 Original photo borrowed from Yelp user Diana L.
We tried to play it cool while sitting down and ordering our food. (My personal favorite is the smoked coconut cheesecake. The accompanying coconut ice cream is divine.) But we couldn’t help tittering among ourselves and stealing glances, like, every two seconds. Tyra was dressed down, but it was hard to mistake her big eyes, tiny face and of course, signature fivehead. At some point while we were waiting for our desserts to arrive, someone from her table leaned over and asked us if we wanted their extra food. I think I speak for the group when I say we would’ve gladly gobbled even their leftovers, but it turns out that they had ordered too much ice cream, and the newly arrived scoops sat on their table, untouched. Getting two bowls of free ice cream is good enough. But getting it from the hands of Tyra Banks?!? Unbelievable. We graciously accepted, ecstatic that now we had an ~in~ with the next table. Drew tried to insinuate to them that he’d like to take a group photo, but Tyra wasn’t having it, and then I couldn’t help it — I only had one chance, and I had to take it! It’s unbecoming of journalists to lose their minds around celebrities, but I have no regrets. I was in the presence of greatness, y’all. I think Tyra just kind of looked at me in response (I was paralyzed by her flawlessness), then they went back to their conversation, and we went about trying to surreptitiously take photos of ourselves with Tyra in the background. I’m sure she knew — it wasn’t my proudest moment, but in this world of pics-or-it-didn’t-happen, only a snapshot will dispel the doubters. If you still don’t believe it was Tyra, she Instagrammed a selfie during her visit to Spot. Eventually we settled down and thoroughly enjoyed our desserts. After Tyra and her friends left, one of the waiters came by and joked that they still had the cup that she had used, as if to imply that we would wish to obtain it or something. Haha…who would be crazy enough to want that? Certainly not me……. Drew is pretending to nom some food. You are currently reading That Time I Met Tyra Banks and Ate Her Ice Cream at auradis.